According to the Alzheimer’s Association, more than 5 million Americans are living with Alzheimer’s and by the year 2020, that number is projected to reach 16 million. Every 66 seconds, someone in the U.S. develops Alzheimer’s Disease. So, will you be one of them? Because of this, people will do everything to reduce their odds. Yet, it's important to note that Alzheimer’s Disease is only one of the potential cause of dementia. The Alzheimer’s Association that publicizes these statistics is subsidized by Big Pharma. They want people to believe that every memory loss patient falls under the Alzheimer’s umbrella so that they can sell drugs that purportedly address it. During the time that children and adults are being over-vaccinated (flu shot, anyone?) and the over-prescription of brain-altering drugs like antidepressants are prevalent, dementia cases have also been spiking. According to a report in Harvard University “medications are common culprits in mental decline.” Liver’s efficiency when it comes to metabolizing drugs declines as the body ages. The kidneys also fail to eliminate them as quickly as they once did. Due to this, drug accumulates in the body, which means that people taking multiple medications are susceptible to this effect. 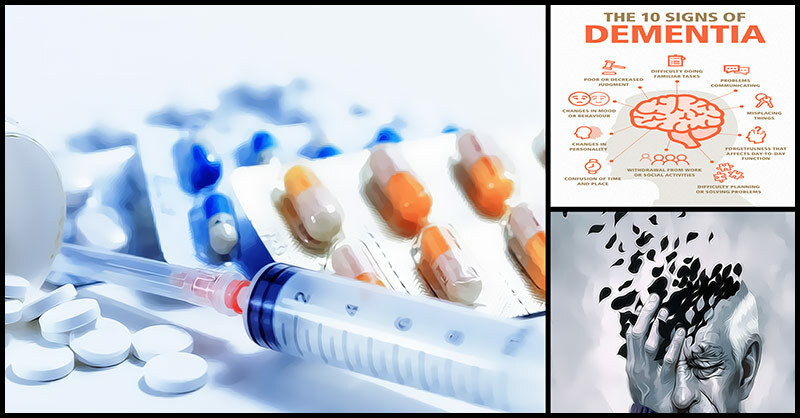 The drugs included in the list which causes dementia-like symptoms are sedatives, narcotics, antidepressants, corticosteroid, anti-anxiety medications, antihistamines, anticonvulsants, and cardiovascular drugs. Since it’s a very broad range of drugs, many elderly people may have been taking one or more medicines from those categories. In a study published in JAMA Internal Medicine, it was found that patients who took Benadryl and other anticholinergic drugs for three years or more had a 54% higher possibility of developing the disorder. Symptoms mistaken for dementia were also caused by vaccines. People aging 40 are increasingly diagnosed with dementia. Researchers believed that environmental factors must be responsible in these cases. Until 2001, mercury-containing thimerosal was widely used in childhood and it's still there in some vaccines, including flu shots, to this day. The Journal of Alzheimer’s Disease published a study showing that exposure to mercury could produce many changes that are often seen in Alzheimer’s patient. Aluminum, which is another common ingredient found in vaccines, has been linked to dementia as well. It’s a pretty smart way to keep the profit machine turning for Big Pharma: They convince people that they need drugs or vaccines and when they cause side effects and illnesses, they sell more drugs to counteract them.